The Worst Things to Tell a New Student of Tarot . . . Here are the dozen (twelve is a sacred number) worst things to tell a new student of Tarot who asks you which deck he or she should buy. Theyve all been used, I assure you! 12. Pick a deck which speaks to you. Suppose an otherwise perfectly good deck cant speak? 11. Pick a deck which feels right to you. What on earth does that mean? 10. Pick a deck which makes you think long and hard. Oops! My mistake; no one ever says this. 9. Buy the Rider-Waite-Smith; its the standard deck. Which flavor of Rider-Waite-Smith? Whose standard? 8. Buy the Rider-Waite-Smith; its easy to understand. LOL! You might as well recommend The Pictorial Key to the Tarot and other books by Waite. 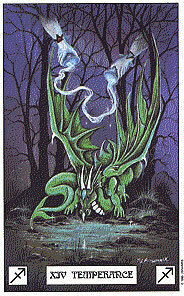 Illustration (above): Temperance from the deck the author loves to hate, The Dragon Tarot, by Peter Pracownik & Terry Donaldson (copyright &COPY; 1996 U.S. Games Systems). 7. Dont buy the Rider-Waite-Smith; it fails to reflect the diversity of humankind. But which deck does? 6. Buy Motherpeace; its Goddess-oriented. Not to be said to men. 5. Dont buy Motherpeace; it bashes men. Not to be said to women. 4. Buy XYZ deck; I plumb wore my first copy out. BTW, if it is The Tarot of Baseball youre up the stream without a paddleeven if you have a bat. 3. Dont buy XYZ deck, its too complicated (evil, dark, misogynistic). Usually said of Thoth. 2. Dont buy the Tarot of Marseilles; the pip cards arent illustrated; youll have to memorize their meanings. Something wrong or unspiritual about studying? 1. Dont even think of buying a deck; you must wait for someone to give you one. If its the Dragon Tarot youre out of luck!